Can you help restore St Mary’s Church? 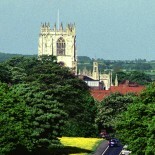 For almost 900 years, St. Mary’s has stood magnificently as an architectural wonder among the great Parish Churches of England. But with the passing of time, the stonework of this beautiful church is crumbling. We need to raise £5 million to restore St Mary’s. Can you help make sure that future generations can enjoy St. Mary’s Church as a place of awe, wonder and peace for years to come? All donations however small or large help. Thanks to a Heritage Lottery Grant a dangerous high-level pinnacle on the northwest side of church was made safe. The grant of £82,100 also allowed us the chance to learn more about stonemasonry and enabled us to welcome a wonderful new stone creature to our collection. The pinnacle and the beaver were fixed to church in October 2017 and now the beaver looks proudly down over passers by. This entry was posted on November 28, 2016 by revbecky in Uncategorized.